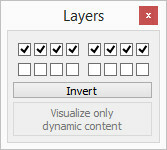 The layer selection dialog is a convenient way to show or hide specific parts of a scene. Each scene object can be assigned to any of the 16 available visibility layers (refer to the object common properties). Using this dialog, you can activate/deactivate each layer individually. If some objects should be invisible, try hiding them in a non-activated layer (e.g. current layer+8). When saving a scene, always try to stick to the default activation state (all 8 first layers enabled, the last 8 layers disabled). The reason for this is that if you copy and paste a model from your scene into another scene, then some objects that were supposed to be invisible might become suddenly visible. During simulation the dialog offers the possibility to only display the scene's dynamic content (Visualize only dynamic content), which oftentimes is helpful for debugging purpose.